"The unlikely but heartwarming tale of a slow-witted but good-hearted alien somehow at the center of every major event of the 22nd century, eventually leading to the enslavement of the entire human race. Tom Hanks plays the title character, a shy xenomorph in love with his first childhood abduction victim, a young girl by the name of Jenny. 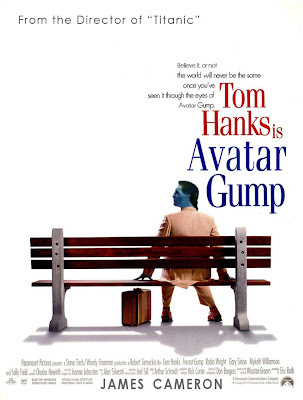 In his epic quest to win her love, Avatar Gump shares the gift of light-speed travel with the human race, thereby marking them for inspection by the Galactic Law Enforcement Agency. When the human race is found unfit for the spread to other planets due to their reckless and harmful habits, they are marked for elimination. With his love doomed for extinction, Avatar Gump has no choice but to steal the only time machine in existence to alter the course of history that leads to the destruction of the human race. By posing as an All-Star football player he meets John F. Kennedy and inadvertently causes his assassination; by posing as a soldier in Vietnam he becomes the war hero John Rambo and has several Hollywood movies filmed based on his exploits; and finally by posing as a world champion Ping-Pong player he's hailed by Richard Nixon whom ends up not resigning from office and catapulting the United States into the most prosperous economic period of modern times. Unfortunately by altering the time line, Avatar ends up wiping all traces of Jenny from ever existing. Finally admitting defeat, Avatar becomes a successfull space-shrimp-boat captain but he forever more yearns for the return of the love of his life." Comments welcome! Leave them below!